The Cobra Strike Maneuver Course (CSMC) conducted at Camp Scorpion is the Afghan National Army Special Operations Command (ANASOC) School of Excellence (SOE) training venue for developing the fighting skills of entire Commando Special Operations Kandak’s (SOKs). The Commandos learn to fight while mounted from the Mobile Strike Force Vehicle (MSFV) as well as when dismounted to conduct patrols and urban warfare. In early 2018 ANASOC fielded its first Cobra Strike Kandak. The MSFVs are heavily armored, mine-resistant wheeled vehicles capable of employing a variety of heavy weapons from their 360-degree turrets. Hundreds of these vehicles have been deployed to Afghanistan over the past several years. The MSFV is a 4×4 armored vehicle that offers a high level of ballistic protection as well as blast protection. Afghan Commandos training at the Cobra Strike Maneuver Course (CSMC) conducting night maneuvers near Kabul, Afghanistan. 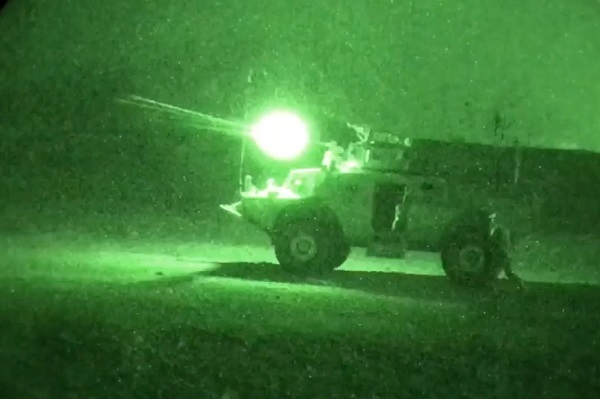 Commandos can operate at night with sophisticated night vision mounted on their Mobile Strike Vehicles (MSVs) that provide fire power during operations. (Photo by U.S. Army Master Sgt. Felix Figueroa, NSOCC-A, Sep 2018). Some of the Mobile Strike Force kandaks that were part of the conventional side of the Afghan National Army were transferred to ANASOC. Initially these units, at the time called ANA Mobile Strike Force (MSF) Kandaks, were assigned to the ANA corps. The MSF Kandaks were designed to provide the ANA with a robust quick reaction force. Since the start of CSMC, U.S. and NATO mentors forming ANASOC’s Special Operations Advisory Team (SOAT) have trained approximately 1,000 Commandos to plan and execute missions beyond the standard infantry Ranger training model taught at SOE Commando Qualification Course (CDOQC). “Commandos here at CSMC learn to incorporate all available assets in order to maximize fire power against a very determined enemy.” (Maj. Trevor Phillips, ANASOC CSMC-SOAT Commander, Special Operations Detachment-North). The 12-week Cobra Strike training course evaluates Commandos on 28 platoon and company-level collective tasks essential for combat operations. As graduation approaches, Commandos spend time conducting day and night live fire mission planning and execution, using the MSFV’s to support dismounted Commandos during training scenarios. Once the Commandos graduate, the Mobile Strike Kandaks (MSKs) earn the Cobra Strike Kandak (CSK) designation. Cobra Strike Kandaks are employed nation-wide, in concert with existing Commando forces, providing an unprecedented level of additional movement and lethality for the Commando force. “This is a NATO effort to stabilize Afghanistan. [With] the training these Commandos receive, the Taliban and ISIS-K simply cannot stand up to them.” (Captain Mike, a Latvian team captain with the ANASOC CSMC-SOAT, Sep 2018). Afghan Commandos assigned to a Mobile Strike Kandak (MSK) conduct dismounted movement towards a training objective during the Cobra Strike Maneuver Course (CSMC) near Kabul. (Photo by MSG Felix Figueroa, NSOCC-A, Sep 2018). As a testament to the training Commandos receive, Fifth Mobile Strike Kandak (MSK), the group currently undergoing training, received activation orders, which interrupted training, to go fight and defeat the Taliban, assist in stabilizing, securing, and clearing operations in Ghazni, eventually returning a portion of the group to complete training. Afghan Commandos training at the Cobra Strike Maneuver Course (CSMC) near Kabul, Afghanistan, test fire infrared (IR) smoke canisters from their Mobile Strike Vehicle (MSV). Daytime firing assists in understanding vehicle capabilities, for employment during night training and operations. (Photo by U.S. Army Master Sgt. Felix Figueroa, NSOCC-A, Sep 2018). According to Phillips, many are still heavily involved in Ghazni operations against returning Taliban. Cadre in communication with Fifth MSK still in the fight, incorporate acquired combat information into on-going training, streamlining battle-drills and reaction time for new Commandos preparing to join the fight against Afghanistan’s threat. 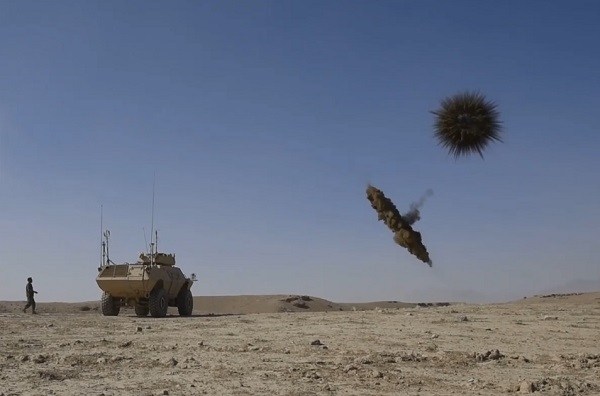 “When employed properly, Cobra Strike Kandaks can bring forth the violence of action necessary to defeat enemy forces threatening the lives of Afghans, and Afghanistan’s security,” said Phillips. “My team is very lucky and grateful to have had the opportunity to partake in such an important mission, shaping the biggest game changer on the battlefield today.” (Maj Phillips). 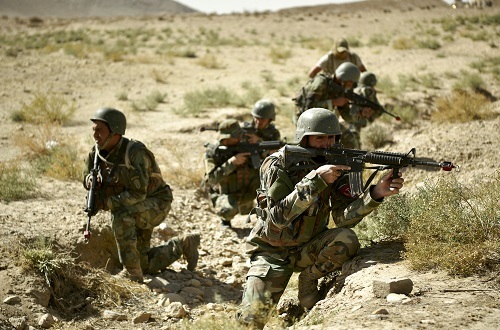 The Afghan four-year modernization plan calls for the doubling of size of the Afghan Special Security Forces or ASSF. The Commando force will increase in size. According to DoD reports 70% of the offensive operations by the Afghan security forces are conducted by Afghan Special Security Forces (ASSF). 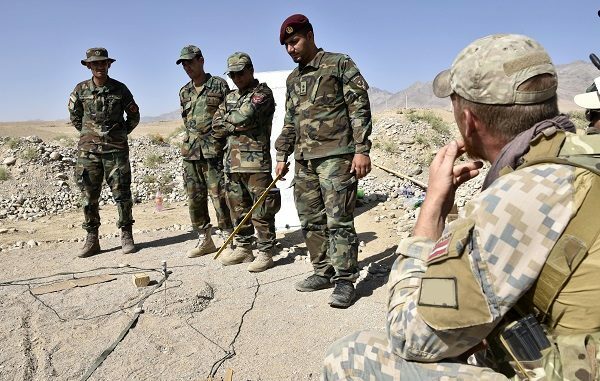 Top Photo: Latvian SOF officer is briefed by an Afghan officer assigned to an ANASOC Mobile Strike Kandak during the Cobra Strike Maneuver Course near Kabul. Photo by MSG Felix Figueroa, NSOCC-A, Sep 2018.